Over the years, we’ve renovated most of our cottage, inside and out. We have an enclosed front porch where we have a table and chairs for dining and a bed for lazy afternoon naps. The floor has been in terrible condition and the goal has been to replace it. 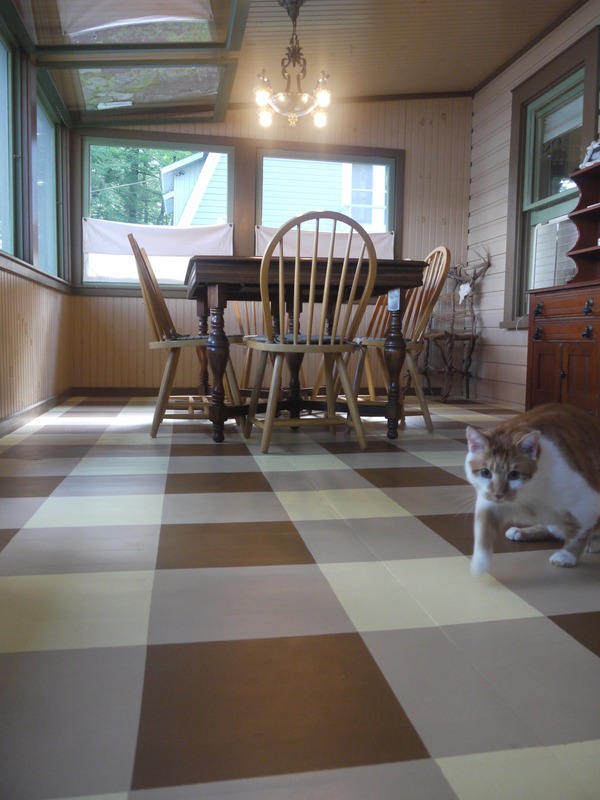 But, the funds have not been available, and after fourteen years, we finally decided to paint the floor plaid. Yikes! We need a new floor. 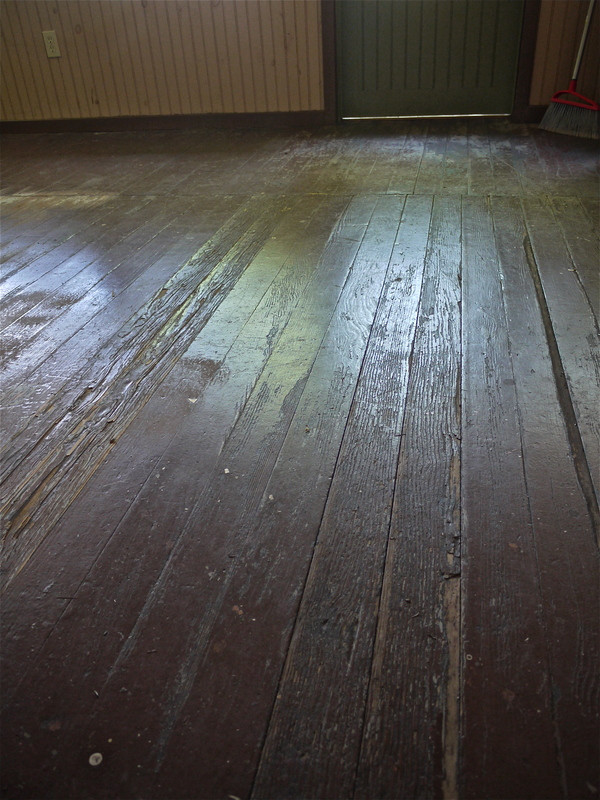 First, Mike sanded the floor – the most important step in preparation. There were several deep gouges and he filled the deepest ones with Bondo. Wood filler would crack in such a deep gouge and take days to dry. The Bondo dried smooth in half an hour. And now the fun began. We decided to paint the floor plaid. We thought we would like the look and also reasoned that it would help to camouflage the imperfections. Here’s how to do it: Choose three colors. Ideally, two of the colors should form the third color when combined, as it would in a true plaid, but artistic license is allowed. First, prime the floor. After drying for 24 hours, paint the entire floor the “combined” color – “A” in the photo. Again, after drying for at least 24 hours, mark a grid pattern on the floor. We used a long board and a pencil and made our squares 12″. Next, using masking tape, mark off all the “B” squares and paint. The tape may be removed when dry to the touch. The next day, mask off all the “C” squares and paint with the third color. When dry, remove the tape. It’s best to allow the floor to cure for 48 hours before using. Gabe checking out the “new” floor. We are happy with our results, we saved a lot of money, and we kept all of the old wood out of a landfill by using some elbow grease, paint and a little ingenuity. Let me know if you try it yourself and how it works out. 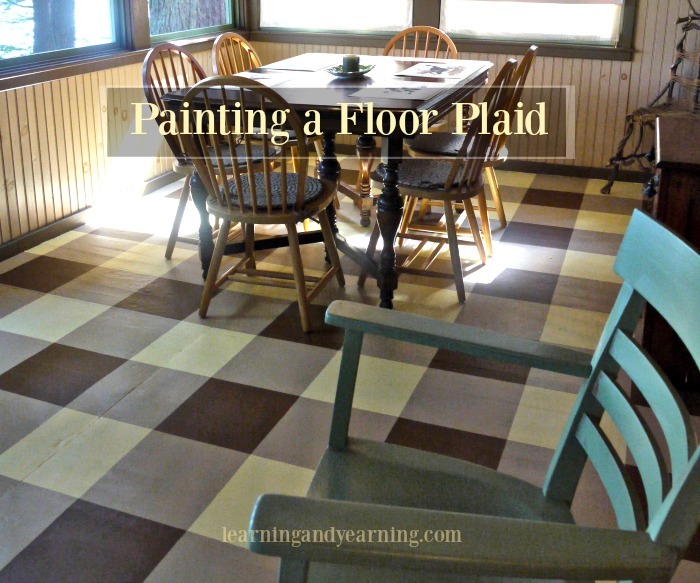 A really great idea for the cottage or really any floor…like a bedroom floor or a study…thanks for this idea. Your website colors of pale, pastel green tea text on white background is impossible for those withe certain forms of color blindness to read. A pity, since I wanted to see how the plaid was done so crisply. Have a word with your website designers, please.! I’m sorry to hear that you had a problem reading this post – the text is black not green, so I’m not sure how to remedy the problem. Best of luck to you.